« Modo for Fulldome, Part 2. As introduced in yesterday’s post, you can download my Mac command line tools, om_sphere2dome to help convert Modo spherical projection images to fulldome domemaster images. For reference, I’ll here post the tool’s help info, so you can see its feature set more easily. image file to a Domemaster image file (180 degree fisheye). center square is extracted and transformed. Optional. Vertically flip the image. Optional. Size of output image. 12, no longer with us. Modo for Fulldome, Part 2. 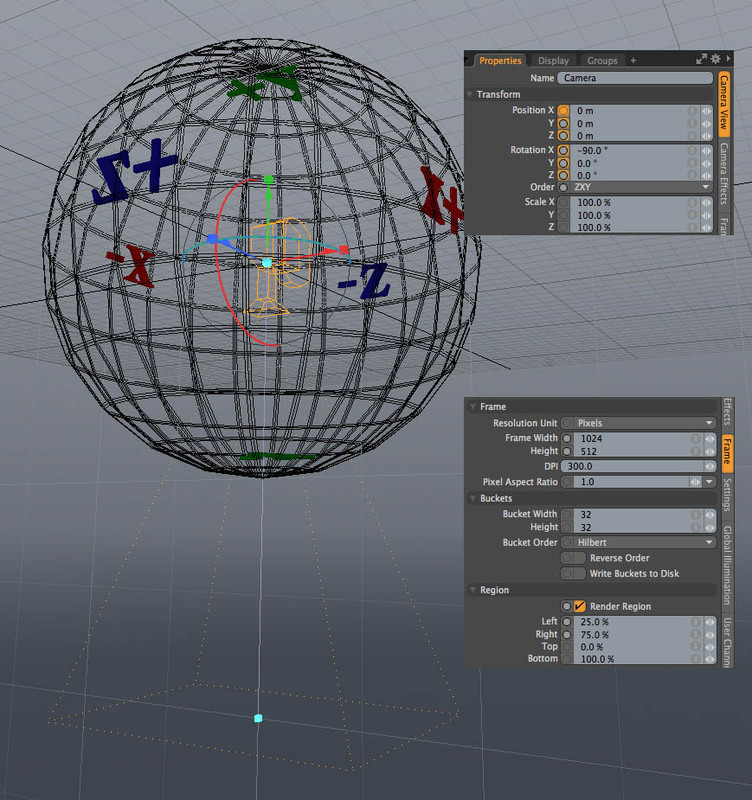 This post will describe a means of creating fulldome domemaster images using Modo. The interchange format for digital planetarium movies is a Domemaster (or Dome Master). Since planetaria require extremely high resolution (4k at least, some are using 8k), these are often delivered as a hard disk full of individual, numbered PNG files. 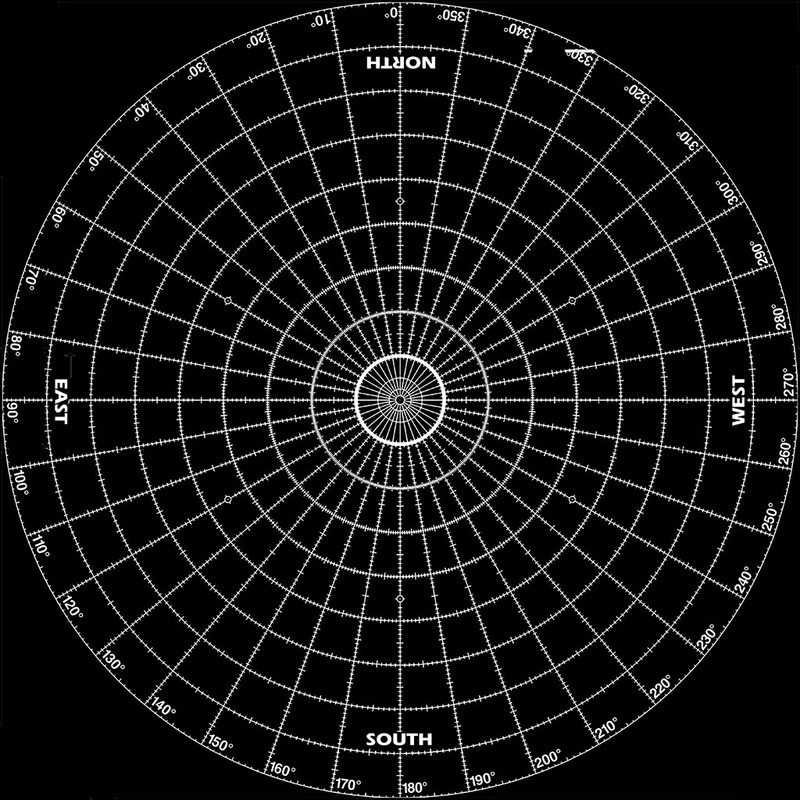 This is an “equal-azimuthal projection”; radius from the center corresponds directly to latitude. 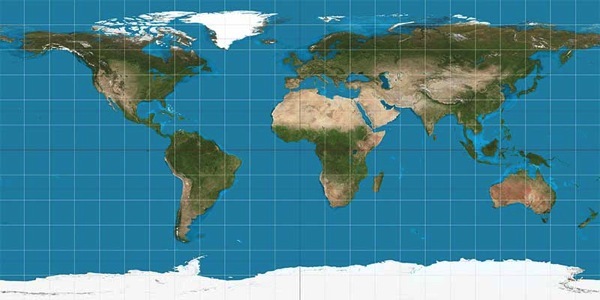 A nice attribute of this projection is that it looks quite natural even when it is flat. In this image, the audience would be facing South. I grew up with one in the hallway. It fascinated me how Antarctica was smeared across the entire bottom edge. 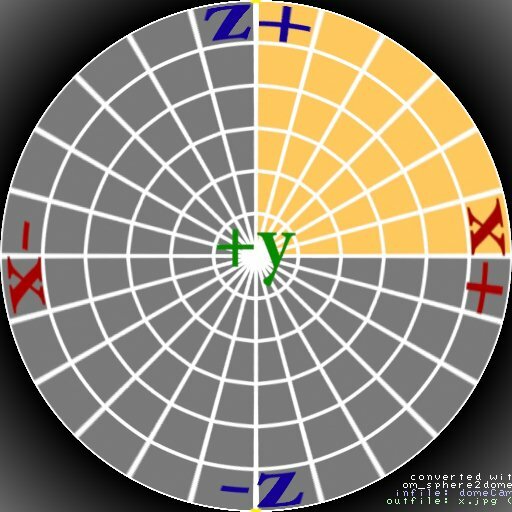 In this projection, latitude goes vertically from -90° South to +90° North, and longitude goes horizontally from -180° East to +180° West. 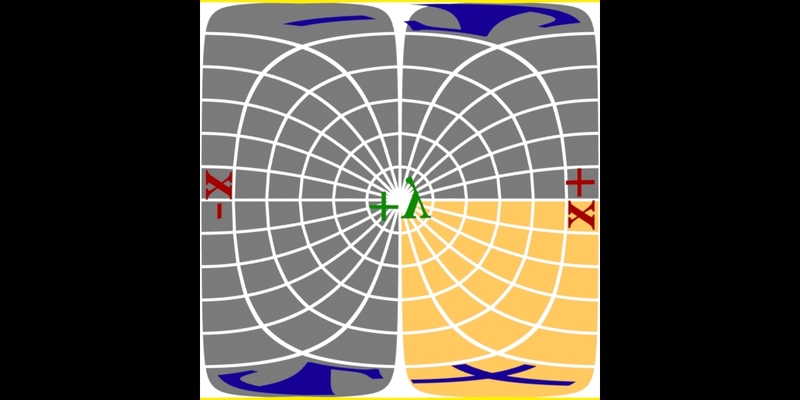 To make the gridlines square, the width is generally twice the height. I did some experiments with Modo’s spherical camera. 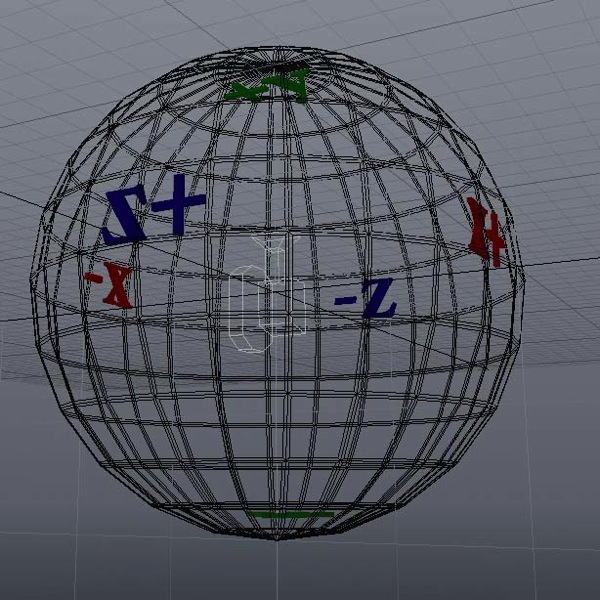 The model is a closed sphere, with the axes labeled. Modo’s standard axes are Y-up, X-right, and Z-towards-you. And here is Modo’s rendering, using Modo’s Spherical Projection Mode. The center of the render is from exactly behind the camera. We only need the center square for our dome master (half the spherical scene). 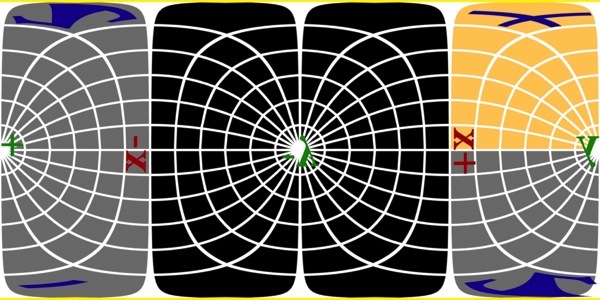 The image is inverted (the “y” is backwards). To address the first two, in Modo we point the camera exactly away from our center of interest, and we use the Frame Properties’ Render Region, to skip rendering parts of the scene we won’t need. The saved files will still be twice as wide needed, though. And here is what what gets rendered! As of today, the tool is in primitive form, and has limited image quality, and only for Mac OS X at the moment. But if you come across this and need it for Linux or Windows or have a feature request, or want the source code, please email me, poly@omino.com. It’s a living work. As it is, it’s just barely sufficient for my needs, and no more. For Photoshop — Andrew Hazelden maintains this set of installable actions which can also do this transformation. For converting a whole Modo movie render, you’ll need to do a bit more scripting on top of it, and it will run fairly slowly… but it’s great to have options! His action set has many other tools as well. « Modo for Fulldome, Part 1.